Yes, same here! It’s very highly social – at least half of my eating out costs are related to time spent with my bestie, tbh. The rest are my informal taco date night with Boyfriend, and occasional takeout for D&D/true laziness. I eat out by myself maaaaybe once or twice a month – sometimes not at all. I’m another knitter. I was off and on with it for a long time, but have gotten a lot more dedicated the last two years. Between discovering higher-end and indie hand-dyed yarn, and expanding/upgrading my knitting tools, I’ve spent just under $700 per year the last two years (from $0-$100 annually before that). I’m now very out of space to store yarn and have to knit up stash before I can buy any more, and am satisfied with my range of needles and other tools, so I expect it will be quite a bit less this year. I also read a lot, mostly from the library, but I do have an audiobook subscription that’s $13 per month, and I buy a few ebooks a year, maybe $60 on average. edit: I forgot that spending on my reading habit includes $50 per year to be a voting member of WorldCon so I can vote on the Hugo awards, because I am a capital-n Nerd. It ends up paying for itself in e-books, because you get a packet with most of the finalists to read. In the summer my partner and I hike, that’s $35 for annual park pass, maybe another $35 in increased gas costs to drive to trails, I needed new hiking shoes for the first time in about 5 years last year, $100. I think I need to edit my hobby. I’m pretty sure my hobby is now my cat. XD (I spend more on her than art by a long shot). Fitness - $40/month for a yoga studio (may end up higher, this just gets me 5 classes and I supplement with YouTube), and $300ish annually on race entries and running paraphernalia. Entertainment- we don’t have cable but do have Netflix, and Hulu, and Amazon, and had Filmstruck before it went away, and will get the criterion service whenever it launches. So 40/month or so there, and now that we’re in a town with a great nonprofit cinema we have a $90 annual membership plus probably $30/month in movie tickets. I know this seems like a lot but we watch 100+ movies a year and love them. Oh, and we became members at our local art museum! That’s $85 annually. I don’t even know what this all adds up to and I can’t be bothered to math right now. Booze- we like our fancy beer and cocktails. At least I mostly make cocktails at home where they are cheaper? But it’s really a fun creative outlet for me - I love making up new ones and trying to custom craft them for people’s tastes. We probably spend $75-100/month on booze, and that may actually go up now with so many amazing breweries in our new town. I do not regret this. Criterion service! I hadn’t heard that yet; must check it out. @ielerol you just reminded me my state parks have a Passport Club and Hiking Club - both are geared more toward kids, but I think it’s super fun! Passport Club is what it sounds - a physical Passport you can get stamped at each park office. Hiking Club has specific trails to complete and mark off the answer to “secret” questions. I ended up biking a lot more last year, but love hiking. Do you have any recipes you’d like to share? I love fruity drinks, except I’m pregnant right now - so I’d love to hear any mocktail ideas you have! Also - how neat that we have so many knitters/crocheters here! I was thinking the same thing. Would anyone be interested in a “Share your WIP” type of thread? Is there a place for that here? I think it would be fun to post updates/pictures and/or resources for projects we are working on. I know I would love to see what others are doing and maybe get some help sometimes. Hmm - I haven’t done this, but I actually think you could probably make a pretty good mock Mai Tai if you got some orgeat - it’s an almond syrup that’s the secret ingredient. I’d do a mix of orange, lemon, and lime juice, plus some orgeat and angostura bitters, and a splash of (preferably homemade or at least not the bright red fake) grenadine. Ingredients listed in decreasing amounts, but not totally confident on ratio… You could throw some pineapple juice in there too if you wanted. I have recently started pottery for the fourth time in my life. Classes are $135 per 8 week session, but do not include clay, which is $25 per bag. I have only finished a few pieces this session, and have recycled the rest back to clay to use during the next. I feel good about spending $20 per week, it’s about what I would spend getting drinks with a friend, but this is a bit more productive and I am meeting new people in a low stakes way. I also dabble in sewing, but without dedicated space, I find that I do it in spurts. My husband and I bought fabric for Christmas projects this year and that probably cost about $200, but we still have quite a bit of fabric left for future endeavors. I bought a new pattern and fabric for a sundress as well, but that has yet to see the light of day. For other crafters/artists: do you have dedicated workspace? I find the drag of setting things up and taking them down stresses me out enough that I sew less than i would like. I do, yes. But it’s also way more chaos-y than I’d like. I have a “wet” studio in the unfinished basement of our house-- where anything sculptural or paint-y happens beyond watercolor. And I have drafting table and an art computer set up in my bedroom. But both are dirty and cluttered and not enticing to sit down at, and I need to fix that. I don’t really have a dedicated space. This is fine for almost everything, because the only real “set up” you need for knitting or crochet is just picking it up in your hands! My afghans get really cumbersome to move around, though. I tend to leave those in my booknook once they get too big to fit in a project basket, and then I’ll often work in the booknook and otherwise just use the half finished afghan for its intended purpose while I’m reading there. Something like sewing or painting, which needs more equipment and which has more delicate/messy in-between stages, seems to benefit a lot more from dedicated space. Not gonna lie, one reason I haven’t gotten into sewing is that I’d have nowhere to put a machine. With sewing, I have more trouble with space to cut things out than where to put the machine. I would ideally like a dining room table sized thing. I am better at mending things, because there is not as much cutting out needed. With sewing, I have more trouble with space to cut things out than where to put the machine. I would ideally like a dining room table sized thing. 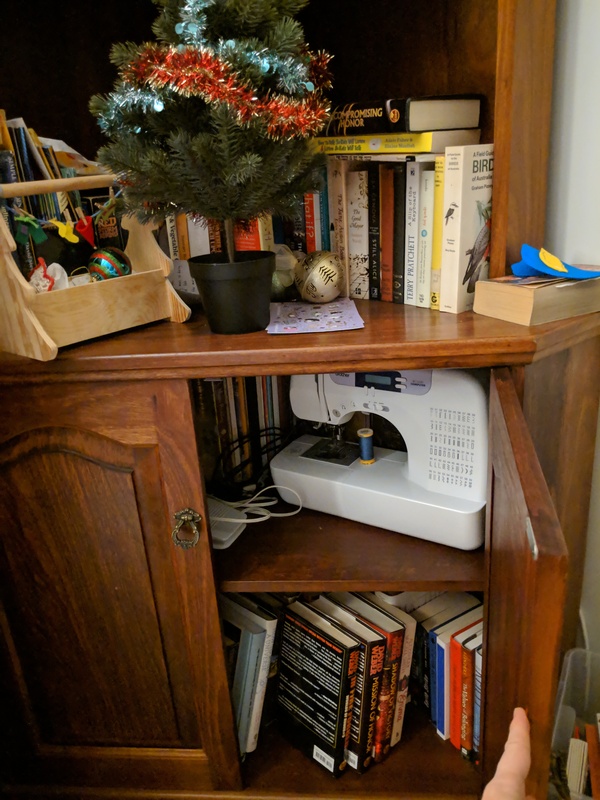 What does your sewing space look like? I know you do a lot of sewing and cutting for your business. Those spaces sound nice! I think the being dirty and cluttered is a cyclical thing for me as I am not naturally tidy. I am throwing on the wheel mostly. It’s been fun, if not frustrating at times. I do triathlons and distance running events and spend about $200/month (in addition to a gym membership that I’d have anyway). This includes travel for races so it’s kind of a vacation expense too. My expenses are mainly gear, nutrition, and race entries. Expenses will fluctuate a lot depending on the events I’m doing - if I’m doing a full Ironman for example, I’ll be spending a LOT more than if I’m just doing some halfs. I have done some cross-stitching and really enjoyed the methodical nature of it, but I don’t like that I don’t create anything useful from it. There’s only so many cross-stitched pictures I want around my house. That’s so cool! I didn’t know that. I average $300/year on my yard/garden. Over the last 10 years that has ranged from a low of $50 to a high of $600. Crafting supplies average $113/year (low of $15 to high of $358). This is mostly “yarn”. By “yarn” I mean old sweaters that I take apart for new-to-me yarn. Any craft supplies that I buy specifically for making into gifts are not part of this total - that is categorized as a gift expense. Recreation averages $1650/year. (high was $3000, twice). This includes about $450/year for dance classes and $550/year for gym membership. The gym expense is fairly new, though (one year), so that’s going to bring up my yearly average. The rest is mostly watersport-related such as boats, equipment, sport-specific clothing. Also classes, launch fees, and transportation to get to the water (when I ride with someone else and pay for gas).